The current debate about food stamps is fantastic—unless you are someone who likes facts and evidence. To follow the congressional debate about food stamp (SNAP) funding in the Farm Bill—and media coverage of that debate—you would think that the relevant issues are the deficit, rapists on food stamps, waste and abuse and defining our biblical obligation to the poor. The only thing missing from that conversation is the state of hunger in America today and how we should respond to it. “A good part of the food stamp debate in Congress and the media is not an evidence-based conversation, it’s fantasy-based,” says Jim Weill, president of the Food Research and Action Center (FRAC), a nonprofit organization working to improve public policies to eradicate hunger in the United States. Weill insists that there is plenty that we know about food stamps that Congress and the media are busy ignoring, including from the government’s own data: a January 2013 Institute of Medicine (IOM)/National Research Council (NRC) report clearly described the inadequacy of SNAP benefits for most people struggling with hunger. “The whole thrust of the report is that this is not a benefit allotment that’s adequate for people in most real world circumstances,” says Weill. Since the average benefit for a SNAP recipient is just $4.50 per day, this conclusion shouldn’t come as much of a shock. But the authors—who comprised a blue-ribbon panel charged with conducting a scientific analysis of benefit levels—did a good job breaking down exactly why the benefit allotment might come up so short. There is also a bizarre assumption in the SNAP program that food prices are consistent across the nation—from Snohomish County, Washington, to Neodesha, Kansas, to New York City. Benefits are adjusted only for Hawaii and Alaska. Any one of these factors would be sufficient reason to revise upward the amount of assistance offered to hungry families, but there is more. Even the way a family’s monthly net income is calculated is flawed. For families with earnings, Social Security or other income, there is a shelter deduction capped at $469 (unless there is an elderly or disabled member of the household). The report notes “considerable evidence that [SNAP] households face housing costs in excess of the current cap on the shelter deduction, which results in overestimation of the net income participants have available to purchase food.” Translated, SNAP families are paying more for housing—and have less income available for food—than the government is assuming; the SNAP benefit is lower for many families than it should be due to flawed assumptions about their net income. In calculating net income there are also no deductions permitted for out-of-pocket medical costs for nonelderly, nondisabled SNAP participants. Weill sees a willful ignorance at play “in some corners of Congress” when it comes to examining current benefit levels. 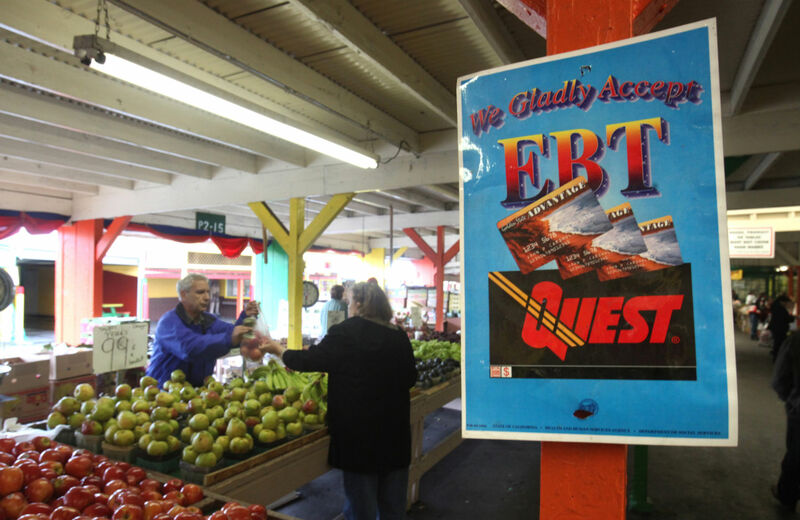 “It’s possible that the inadequacy of SNAP benefits might have better come to Congress’ attention if the House of Representatives—among its numerous hearings on the Farm Bill—had held a single hearing on the food stamp program, which it didn’t,” he says. Also, for all of the GOP’s talk about designing welfare programs that move people towards self-sufficiency, it is completely ignoring (as are too many Democrats) new research showing that SNAP does exactly that. And yet here we are, teetering on the edge of cutting $21 billion from a SNAP program that is assisting one in seven Americans; it’s a cut that would remove 2 million people from the program and cause more than 200,000 low-income children to lose access to school meals. Even the Democratic-led Senate is proposing a $4 billion cut, which the Congressional Budget Office estimates will result in 500,000 households losing $90 per month in SNAP benefits. You can let Congress know that current proposals to cut the SNAP program ignore all of the evidence—that we need to protect and strengthen the program. Participate in today’s National Call-In Day to Protect SNAP. Workers at Guitar Center’s Manhattan location are unionizing. Read Allison Kilkenny’s report here.